NHLPA & NHL team up to raise and donate over $850,000 in October bringing the HFC 14-year total to $12.8M. NEW YORK / TORONTO (November 21, 2011) – The National Hockey League (NHL®) and the National Hockey League Players’ Association (NHLPA) raised and donated more than $850,000 for cancer organizations during Hockey Fights Cancer™ Awareness Month in October. With support from the entire hockey community -- including all 30 NHL clubs, NHL players, management and fans -- contributions helped bring the total raised for cancer organizations to $12.8 million in the 14-year history of Hockey Fights Cancer. The NHL and the NHLPA launched the month-long initiative with a total donation of $220,000 distributed in grants to The Leukemia & Lymphoma Society, Prostate Cancer Canada, ZERO - The Project to End Prostate Cancer, the Pancreatic Cancer Action Network and local cancer charities in all 30 NHL markets. Meanwhile, NHL teams and fans helped to raise more than $630,000 for cancer organizations and hospitals throughout the month-long initiative. Close to a half-a-million fans attended Hockey Fights Cancer Awareness Nights that were hosted by each NHL club, helping to raise funds for local charities, and more than 15 million viewers tuned into national and local telecasts that participated in these awareness nights through extensive broadcast coverage of the initiative. Members of the Congressional Hockey Caucus and Canadian Ambassador to the United States Gary Doer joined life-long hockey player Senator John Kerry (D-MA) in support of Hockey Fights Cancer Awareness Month by designating Thursday, October 13, as Hockey Fights Cancer Day on the Hill. The inaugural awareness day on Capitol Hill involved Members of Congress and other political dignitaries pledging public support for the hockey community’s effort to fight cancer. The NHL once again created commemorative Hockey Fights Cancer™ merchandise - including men’s ties by Vineyard Vines, New Era ladies caps, Reebok men’s caps and ladies track jackets, t-shirts by Old Time Sports, Inc., ladies charm bracelets by LogoArt, keychain and money clip sets by JF Sports and REFLECTIONS 2011- The NHL Hockey Year in Photographs. The men’s Hockey Fights Cancer tie was the top selling item on Shop.NHL.com in October while the overall sales of Hockey Fights Cancer products online increased 22% over last year. Hockey Fights Cancer™ is a joint charitable initiative founded in December 1998 by the National Hockey League® and National Hockey League Players’ Association. It is supported by players, NHL member clubs, NHL alumni, the NHL Officials’ Association, professional hockey athletic trainers and equipment managers, corporate marketing partners, broadcast partners and fans throughout North America. The goal of Hockey Fights Cancer is to raise money and awareness for national and local organizations involved in cancer care and research. To date, Hockey Fights Cancer has raised more than $12.8 million. Hockey Fights Cancer is a component of The Biggest Assist Happens Off The Ice®, the National Hockey League’s and National Hockey League Players’ Association’s social responsibility program that builds on hockey’s long-standing tradition of addressing important social issues in North America and around the world. 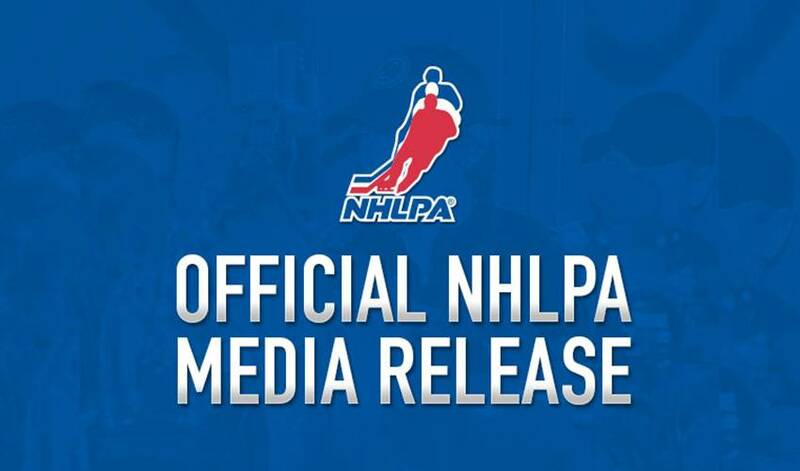 National Hockey League Players’ Association, NHLPA and the NHLPA Logo are registered trademarks of the NHLPA. All Rights Reserved. NHL and the NHL Shield are registered trademarks of the National Hockey League. Hockey Fights Cancer is a trademark of the NHL Foundation. All Rights Reserved.